(TibetanReview.net, Aug11, 2018) – Following a rebuttal by Congress leader Manish Tiwari and some historians, Tibet’s exile spiritual leader, the Dalai Lama, has expressed apology for his Aug 8 remark in an interaction with students in Goa that Jawaharlal Nehru could have avoided India’s partition by listening to Mahatma Gandhi to let Mohammad Ali Jinnah become India’s first Prime Minister. “My statement has created controversy, if I said something wrong, I apologise,” timesofindia.com Aug 10 quoted the Dalai Lama as saying. He has also thanked Nehru for supporting the Tibetans’ cause when thousands of them, including monks, fled their motherland after China annexed the mountain country in 1950. “I had a close relationship with Nehru, who suggested to have separate schools to preserve the Tibetan thought. He (Nehru) supported the Tibetans’ cause,” the Dalai Lama was quoted as saying. 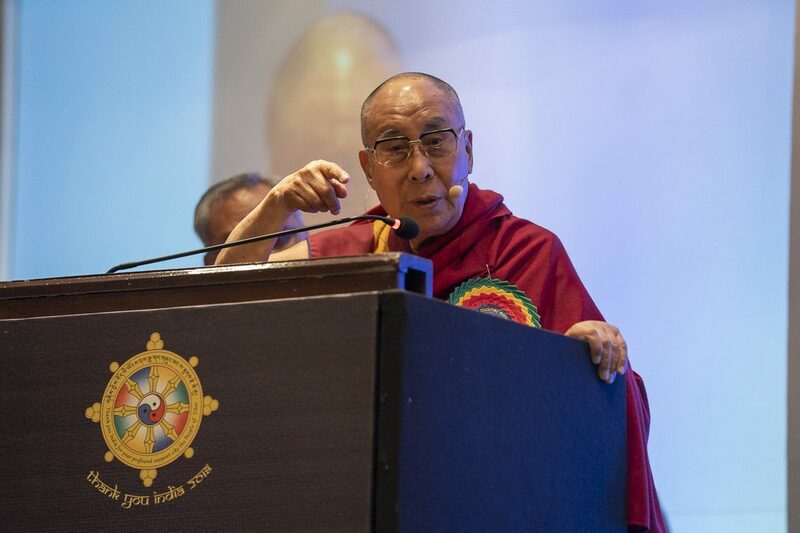 The Dalai Lama has expressed his apology while addressing a “Thank You Karnataka” event in Bengaluru, a part of “Thank You India – 2018” announced by the Central Tibetan Administration earlier this year to mark the Tibetan community’s commencement of 60th year in exile in the country. Those who attended the event included Chief Minister HD Kumaraswamy of Karnataka state, with the venue being the Taj Hotel. It was organized by the five Tibetan settlements in the state. The chief minister called it a privilege and honour for him to be taking part in the event with the Dalai Lama. He was stated to have assured utmost support and cooperation for the Tibetan people while offering high salutations to the Dalai Lama. CTA President Lobsang Sangay and Speaker Khenpo Sonam Tenphel have also addressed the gathering. Following the Dalai Lama’s Aug 8 remark, Congress leader Manish Tewari took to Twitter and said that the historical records suggested quite the opposite of what the Dalai Lama had said. The 83-year-old spiritual leader had given the Nehru-Jinnah example while responding to a question from a student on how one could be sure about one’s decisions and how to avoid mistakes. He had said it was important to respect opinions of stakeholders and to analyze all ends before making a big decision. The student interaction followed the Dalai Lama’s keynote speech at the Goa Institute of Management in North Goa’s Sanquelim village. He had touched upon many aspects of emotional consciousness. And he was reported to have spoken on India’s ability to merge its rich traditional knowledge with the modern facets of education. He had also stressed the need for dialogue and debate on a range of subjects. Historian S Irfan Habib has suggested that what the Dalai Lama had said could be his perception. “It is certainly not a fact of history. Partition was such a huge tragedy, no one person could be held responsible. Two decades of communal politics and the propagation of the two-nation theory led to Partition. What the Dalai Lama has said is just another statement in the line of many in the category of Nehru-baiting,” tribuneindia.com Aug 10 quoted Habib as saying.